We all know adults who could use a refresher on how to properly care for their teeth. Brushing their teeth twice a day is not their main priority and it shows. Like most adult habits, good oral hygiene starts as a child. Children learn a lot from their parents, including how to properly care for their teeth. If you want your child to grow into an adult with a beautiful, clean, and healthy smile, you need to teach them how to care for their chompers at a young age. Good oral hygiene is important for kiddos too. They should brush their teeth twice a day, just like adults. Keeping their teeth and mouth healthy as children will help set them up for better oral health in the future. At Brookside Dental Care, we can provide you and your family with the dental services needed to keep everyone’s teeth clean and healthy. Our common dental procedures can help improve your oral hygiene, but practicing preventive care at home will ensure you don’t run into serious dental issues down the road. You want your kiddos to have healthy teeth and practice good oral hygiene. While our services can ensure your child’s teeth are healthy, teaching them how to properly care for their teeth is much more important. This is something they will continue into adulthood, so teaching them good dental habits now will pay off in the long run. In this blog, we are going to go over some tips to teach your child how to properly care for their teeth. Read on to learn more and start your child’s dental habits off right! First, you need to make brushing more fun for children. They don’t see the importance of having good dental habits or brushing their teeth regularly. Allowing your child to pick out a fun toothbrush is a great way to get them excited about brushing. There are a ton of great toothbrushes for kiddos including ones with special characters, fun colors, lights, or even brushes that play songs. The toothbrushes that play songs are a great choice since they generally play music for as long as your kiddo should be brushing their teeth. After you get your child a fun toothbrush, you can start teaching them how to use it properly! You want to teach your children to brush their teeth for a certain amount of time, which The American Dental Associations says should be two minutes. Allow them to start the timer, whether you use an egg timer or a sand timer from a board game, and make sure they brush their teeth until the timer runs out. For some reasons kids love being timed, so this is a fun way to improve their oral hygiene. Kids are not going to automatically know how to brush their teeth properly. Showing them how to brush their teeth the right way is important. You may notice your child chewing on their toothbrush rather than brushing their teeth, avoid this by brushing your teeth with them and having them copy your motions and which areas of the teeth you brush. 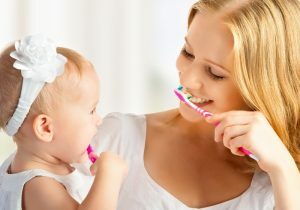 Brushing your teeth with them will allow them to see how it is done and can help them remember how to do it correctly. No, we do not mean you should read books while they brush their teeth. There are children books about brushing teeth that can help them learn more about the importance and how to properly do it! Read these book to them as they are beginning to learn how to brush on their own. They will be excited to be doing the same thing that the characters in the books are doing. If they want you to read this book while they brush their teeth, go for it! It may help them stay more focused on the task at hand. 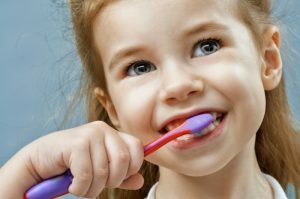 These are a few of the many tips to help your child learn good dental habits and learn how to properly brush their teeth. In a future blog, we will go over a few more tips to help your child care for their pearly whites! And be sure to schedule regular cleanings at Brookside Dental Care for your kiddo! Regular visits to the dentist will help ensure that your child does not have any issues with their teeth and their dental hygiene is good! Contact us today to learn more!